This article is intended as a positive constructive feedback to point out certain flaws of World of Warcraft: Legion. I disagree with how some people address their point of view either as a passive-aggressive complaint, or plainly insulting game developers. So I want to make that clear from the get go. Don’t get me wrong. I have been playing World of Warcraft: Legion now for several weeks. I have completed all quests in Stormheim, Val’sharah and Highmountain (the only 3 regions available for testing in Alpha) and my rogue character sits at the max level available in the current Alpha build: level 106. I have seen pretty good quests, new NPC/mob models, and game systems such as the artifact forge. I might write up another article about the best impressions of Legion, but at the moment it is equally important to address the flaws — as Alpha is a constant iteration process. I know some developers follow us in Twitter, and read our front page (as mentioned by them during our face-to-face interviews or email messages). So hopefully this article contributes to the betterment of Legion. UPDATE: The new patch enabled what I suggested in this flaw. So there … flaw no more. 1. Sometimes the artwork is so dark, I can’t see the grayed-out lines of each path going from slot to slot. Probably a lighter gray should be added to those path lines, but if you are climbing a path, the line between the two active slots should be a vivid (maybe glowing + pulsating) line so that you know what path you are heading to. Just a colored slot cue doesn’t cut it. We need a colored path line to figure out what slot I wish to go to next, once I open the UI. 2. 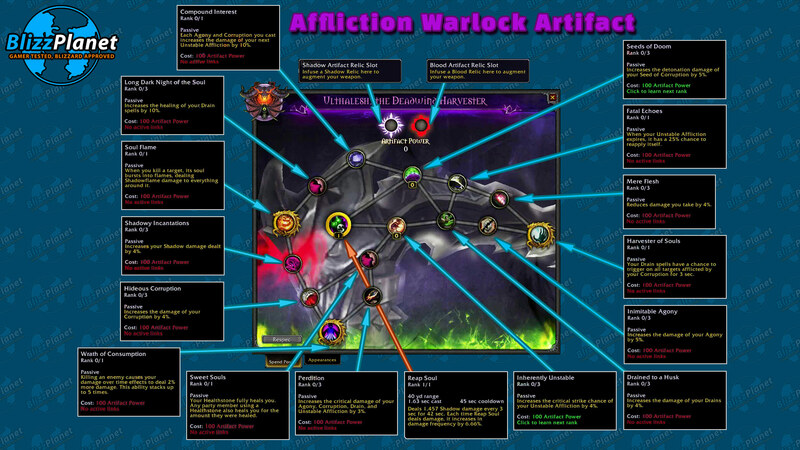 One thing players must know is that filling up all of the slots in the artifact is a long and slow process. You follow a desired path with the goal to reach one of the appealing new abilities which you can add to the spell bar. Each time you add rank points to a slot, the next rank requirement is increased. 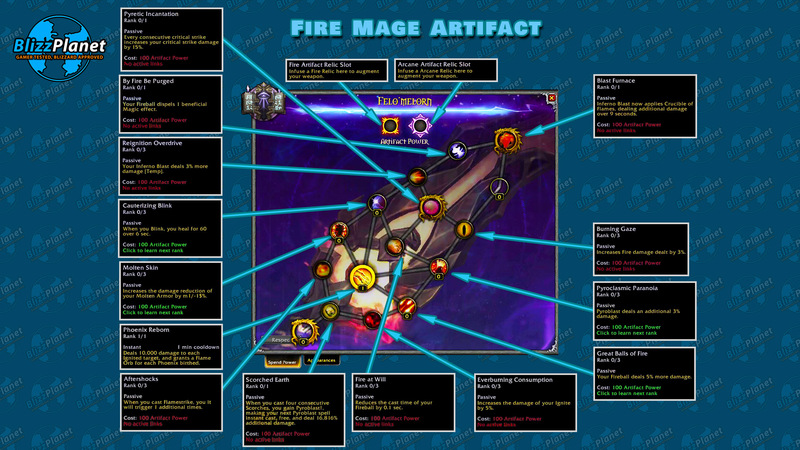 Let’s say the current slot has rank 1/3 (3 being the max amount of rank points you can set in that slot — an example: Burning Gaze in the mage artifact forge image shown below). So just figuratively, the next rank point you apply to Burning Gaze might be 800 artifact power points. You apply it to Burning Gaze to add rank 2/3. The next time you apply another rank point to complete rank 3/3 in that slot, it might cost now 900 points (instead of 800). The next slot (starting at rank 0/3), it will cost 1000 artifact power points, and so on. Each time, the requirement to upgrade a rank costs more and more points. There are only 2 relic slots. Every time you finish a questline in any of the zones, you are rewarded with a new relic — which you can add into your artifact at the top of your artifact forge UI. The relic unlocks a specific slot power, and thus it shortenss the gap between your current enabled slot and the farthest ability slot. In the case of the mage artifact (use the image above as a reference): Blast Furnace, or Pyretic Incantation. That explained, I’m now moving on to the flaw in the forge design. I finish a questline in Stormheim, and get rewarded a new relic. If I replace the Stormforged Horn relic with the new one, I will lose the Stormforged Horn relic forever (it is destroyed). There is no undo either. This presents two problems: I lose the previous relic, and (unless I am mistaken) you lose all the points you had already assigned in the path of Fortune’s Boon. Solutions: In that case, you should get artifact power points refunded to respec those points into the new relic’s path. Add a new relic collection tab in the Forge UI, so that I can switch relics and respec when needed for awareness/testing purposes until you are comfortable with a specific path. Trust me, you earn a lot of relic rewards as you complete questlines in Val’Sharah, Stormheim and Highmountain. Wasting relics without understanding and exploring the full potential of the one you replaced is not good. Switching between them without losing the relic is a better way. Another thing I noticed is that I have no clue what the “+20 item levels” means. I don’t see any signs in the forge UI that let’s me figure out where those 20 item levels were implemented into. It might be a WIP feature not available in the current alpha build, though. UPDATE: Pressing SHIFT + Right Click will open the Artifaft Tab. Thus, this is a flaw no more. I think this is the main flaw of the new game system. 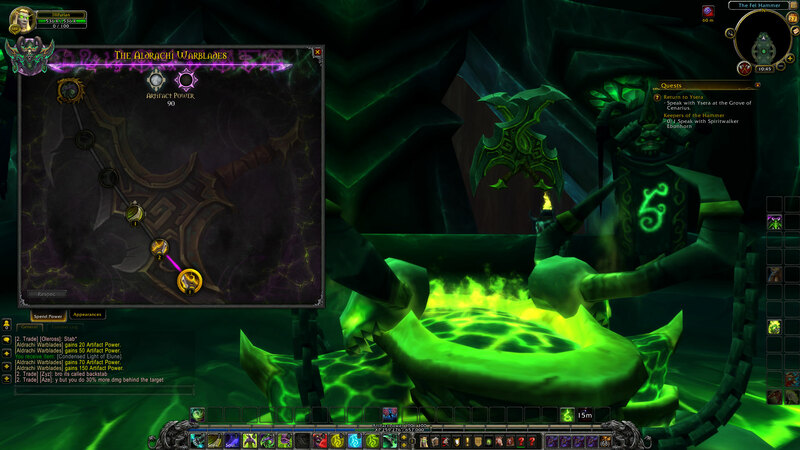 You can only see your artifact’s slots if you are within 5 yards of the forge in the Class Hall (Order Hall). On paper that’s alright, but when you complete a questline and get offered to choose one of two or more relics — your face goes all: “ehh?” You simply have no clue which relic to pick because you can’t see your artifact’s slots to learn what each relic will do, or which is best for you. You are forced to close the quest window, teleport back to the Class Hall and to check the forge to see what each relic reward will do or undo in your artifact. Solution: Under the Character Info (C) window, there should be an Artifact tab that allows the player to check out their artifact the same way they do in the forge, except “View Only,” to make the choice between various relic rewards seamless. 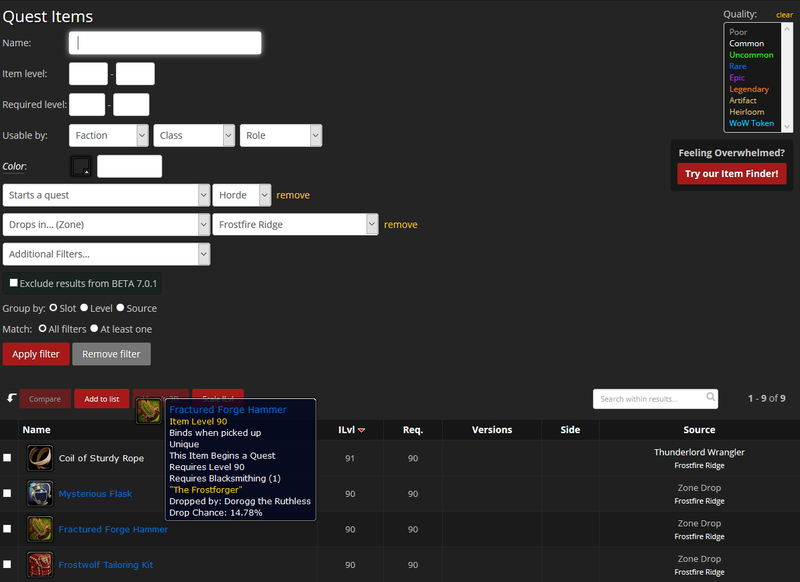 An Artifact Tab would make that experience seamless, and allows you to make better choices when picking a relic. World of Warcraft really needs this new in-game feature. We have the Mount collection and Pet collection tabs which allow us to toggle between the pets and mounts we already have, and the ones we don’t have. We can also learn where to find them, and from who. What about quests? We need a quest tracker able to identify which quests we haven’t yet completed: where to find the quest (i.e. Temple of Elune-Val’sharah) and who or what gives the quest (i.e. NPC: Ysera, or item drop: Smolderhide Warrior). If you are a rogue, you would usually skip in stealth-mode the 10 mobs that other classes would need to kill to reach a specific quest objective mob like Kagraxxis the Corruptor who is hidden deep in a cave. A rogue would never know that he needed to kill one of those mobs he skipped to loot an item that begins a quest. Thus — missing on opening a new questline or at the least one quest that might lead to a cooking recipe or a pet or something else. Thus, a quest tracker is needed to go back and hunt for those items that begin a quest. As an alternative, at least a toggle in the map that shows where items that begin a quest can be found. I am a completionist. I like to complete all quests in each zone. 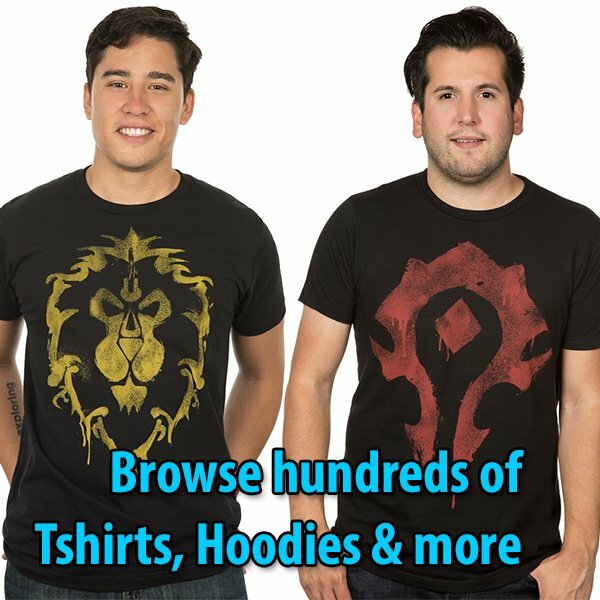 The only way I could find out if I missed a quest is searching in WoWHead for items that begin quests — and that’s not an easy thing to search in their database either. Still I might not have a good memory to filter out those I already completed, and on top of that on which alt character. So yea, an in-game feature is needed. Additionally, once I finished the Malfurion Questline that leads to the dungeon, there was no way for me to know if there were more quests in Val’sharah but by exploring every possible spot in the zone. Might be helpful to get a mark on the map where to find the NPC that starts another questline. UPDATE: The quote below has been fixed. There is now a new quest at the Temple of Elune sending you to Bradensbrook — named “A Village in Peril.” Thus, this is a flaw no more. For example, there are no quests enabled in Bradensbrook. I searched and searched and nothing. However, once I moved through the main road, I found an NPC with a quest just outside Bradensbrook. Completing his quest enabled everyone’s quests within Bradensbrook. A little mark on the map showing me where to find that single NPC, might be helpful. In Highmountain there are quests not tied to any achievement progress, that are pretty hidden. Some NPCs in caves, or tunnels start quests. Some are kinda out of the way from normal exploration like Oenia Skyhorn’s Unresting Soul which starts the Kobold questline. No other quests lead me to Oenia, and unless you explore in the back of Skyhorn’s village, you might miss it entirely for a few months unless you are a miner or herbalist and happen to find the NPC by accident. This is mostly a bug or an “oops” rather that a flaw. I have stumbled upon three quests so far that if you don’t finish them along with the other quests given by the same NPC, or by nearby NPCs’s you won’t be able to turn the quest in. One example is “Lay them to Rest” in The Runewood (Stormheim) which asks me to kill a few ghosts, but the turn in is not Vydhar. It is Shieldmaiden Jounn. I had completed her quests earlier, and she moved to another location inside Haustvad — which results in a question mark in the map where the turn in used to be, and no Shieldmaiden Jounn on sight, because she is now at Haustvad. Or in Val’sharah, the quest Tainted Growth — where Tyrande keeps moving to other locations, and now all I have is a completed quest with a question mark in the map, and Tyrande nowhere on sight. The same thing happened to me in Highmountain when I finished Wrathion’s quests, but didn’t complete Brann Bronzebeard quest — resulting in Brann now being phased out of sight, and no one to turn in the quest with. So those are three extremely rare to find bugs under the condition that you decide not to turn in the quest until later, but it is happening. A solution for that is to not move the NPCs of location until all the quests have been completed. Then give a quest where the NPC says “follow me” or “meet me at” in order to move to another location. Or if there are more than one NPCs, at the end of a secondary NPC quest, create a quest that asks you to talk to the primary NPC in the group to trigger the “Alright, we are ALL now ready to move on to the next location,” to prevent these bugs from happening — not only in Legion, but in future expansions. These are just observations I have experienced throughout my exploration of this expansion, but not a factor to not wish to play the game. Just suggestions for the developers while the Alpha iteration process is ongoing and evolving. Legion is very good so far. I like the artifact, the artifact power mechanic, and the forge. 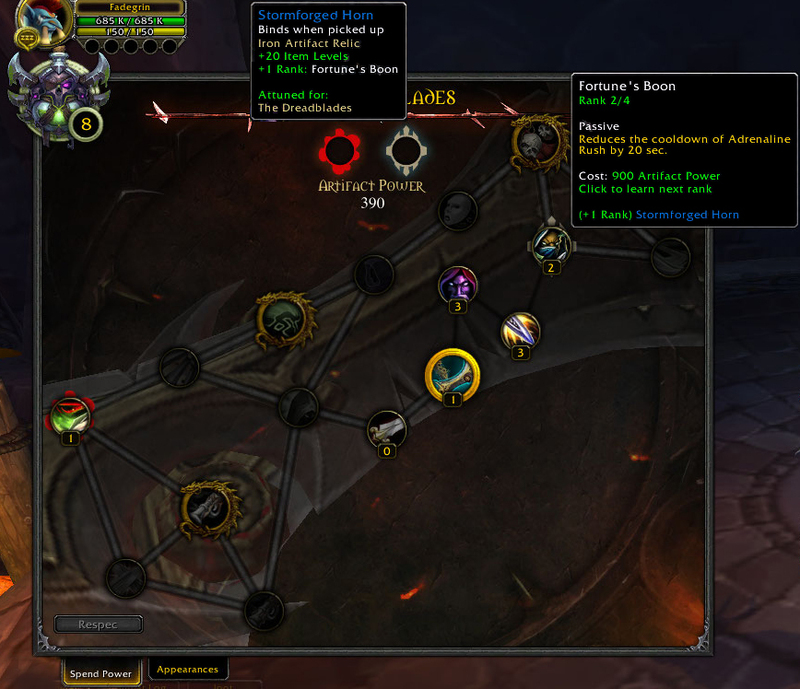 I really hope Blizzard sticks with the artifact/forge system in future expansions — even if we no longer keep Doomhammer, Ashbringer, etc; but new artifacts or weapons entirely that can be transmoged. I do believe in the potential of that game system, and that opens the opportunity for small content patches to include more alternatives to obtain artifact power.